Six elderly monks keep a recipe for a delicious handmade cheese -- one that may soon disappear. Holland is in southwestern Manitoba, about 50 miles from the North Dakota border. Passing it on the highway, as most do, it appears as little more than a grain elevator, a decorative windmill and a mural dedicated to a local champion high jumper. South of town, where the number 34 highway reaches the crest of a hill, you can see the bells of the monastery of Notre Dame Des Prairies (Our Lady of the Prairies). Once a sizable monastery, just six elderly monks live here today – keepers of a recipe for a handmade cheese that may soon be lost to history. Cistercian — or Trappist — monks are vigorously self-sufficient. To earn an income, many make products like craft beer, wine, chocolate and other handmade goods. The monks of New Melleray Abbey in Iowa, for instance, make caskets. At Notre Dame Des Prairies, they make cheese. Their Fromage de La Trappe is a pale orange, nutty, slightly salty, washed-rind cheese that’s sold in just a few stores and restaurants in Manitoba. It’s mid-November and just one degree Fahrenheit, the first cold snap of the winter. But inside the cheese factory, it’s muggy and smells like warm milk. 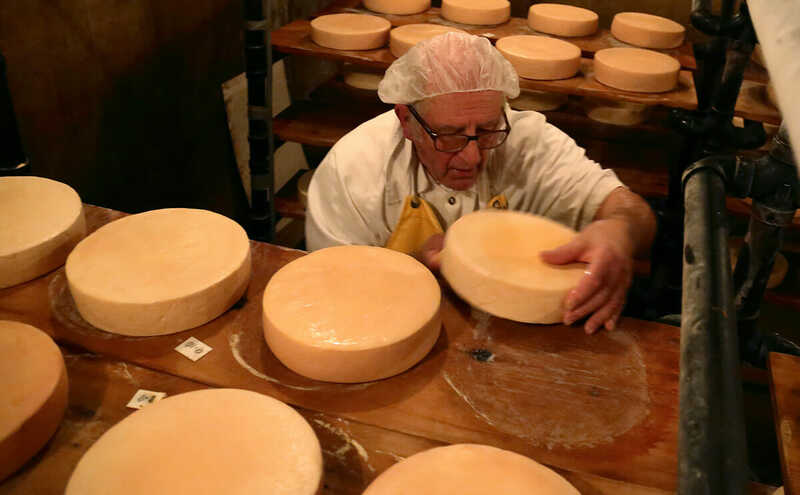 At 80, Brother Alberic is the monastery’s sole full-time cheesemaker. He’s bent with age, but moves purposefully. His English is excellent, though built on a solid foundation of Quebecois French. If you were to squint, you might notice a passing resemblance to Robert De Niro, in a hairnet and rubber boots. His “factory” has the look of a small restaurant kitchen, with plastic buckets full of utensils and milk cans scattered around the floor, and a little statue of Mary peering down from a set of cabinets. Brother Alberic, the monastery’s sole full-time cheese maker. He’s keeping a close eye on a slowly warming vat of raw milk and rennet. When it’s ready, he gets up and dips a pinky finger in the vat to test the thickness, then starts cutting the curds with a tool that looks like an elongated, stainless steel fly swatter. He stirs as they separate from the whey, then using a conical sieve, scoops the dripping curds from the vat, plops them into moulds to shape and then over to a set of presses to drain. This evening he’ll return to put weights on the presses, where they’ll sit overnight. Of course, that’s only the beginning – tomorrow his cheese will be taken to the cellars to ripen. Ripening is the part of cheese making that seems especially suited to the pace of life in the monastery. The balance of temperature and humidity in the cellars must be carefully monitored, and each wheel of cheese must be carefully washed once a day. There are hundreds of wheels in Alberic’s cellar — from plump, pale newcomers to taut, pungent wheels, aged the two months legally required for sale. Each afternoon, Alberic paces the cellar, hauling a plastic bucket of brine. He washes and flips each wheel individually, his heavy breath echoing off the concrete walls. Ripening is the part of cheese making that seems especially suited to the pace of life in the monastery. In the cellar, the old, hunched, monk cuts a timeless figure. A similar process, after all, dates back centuries in Europe. But the story of Alberic’s cheese, as he tells it anyway, begins more recently: with a traveling monk named Brother Alphonse Juin. In 1893, Brother Juin, of the Bellefontaine Abbey in France, brought the recipe for Port-du-Salut cheese to the monastery of Notre-Dame du Lac — also known as Oka Abbey — in Quebec. At Oka, Juin helped the monks develop a namesake cheese, which is still popular in Canada today. According to Alberic, that same technique was originally bestowed on the monks of St. Norbert, Manitoba, as a Christmas gift in 1918. They produced the cheese until 1950; that year, their monastery and cheese factory were damaged when the Red River flooded its banks, ending their commercial cheese business for several decades. 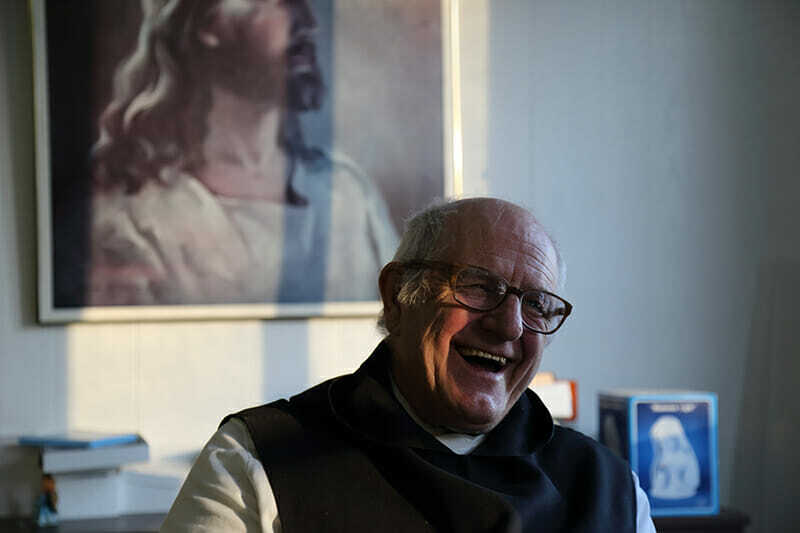 And like the river, the suburbs of Winnipeg soon arrived on the monks’ doorstep, causing the brothers to relocate in the 1970s to the more remote Holland, Manitoba. 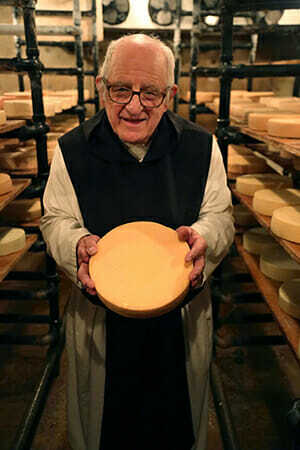 Brother Alberic with his handmade cheese. Alberic also claims to be in possession of a secret notebook, sent to him by the monks at Oka. He says it contains the observations of another cheesemaking monk named Brother Oswald, and with them, instructions to burn the notes if ever he left the business, or no longer found them useful. That’s his story. But it’s a contested one. Agropur – a large Quebec-based dairy co-op – now own the rights to Oka cheese, one in a long list of brands within its fold. Unlike Alberic’s, their products are pasteurized, and though the Oka monks helped the company for many years, today no monk plays a hand the production of Oka cheese. Agropur denies Alberic’s claims that his cheese comes from an original recipe shared by Oka. Two separate company representatives have told me, with conviction, that the best proof of their product’s uniqueness is a taste test. That, I leave up to you. And whether or not Alberic’s cheese descends from Brother Alphonse Juin’s may soon be of little consequence. That’s because, in all his years of making cheese, Alberic has not arranged for a successor. His current helper – 41-year-old Brian Hay – says he doesn’t know if the monastic life is for him. A previous assistant also showed promise, but like so many young men initially drawn to the Trappist life, he soon moved on as well. At this point, Alberic is even considering teaching a non-monk how to make his cheese. He says he has some potential, if unlikely, prospects. But even with the future of his life’s work in question, he remains mostly nonplussed. Alberic, after all, is blessed with a believer’s outlook. If things don’t work out, this life is just an opening act anyway. Alberic spends his afternoon at the cheese shop. It’s sparse, dimly lit, adorned with intense religious iconography – it has little curb appeal. And yet, several customers arrive nonetheless, from who knows where, to buy Alberic’s cheese at the sort of price only a holy man could justify. He’s open just three hours a day, then closes promptly for evening prayer. He’ll be at it again the next day, and the day after that, for as long as he’s able. All photos courtesy Max Leighton.